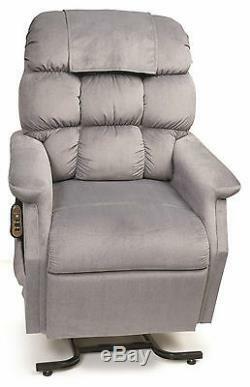 Golden Cambridge 3 Position Recliner Power Lift Chair w/ Chaise Small/Medium. Available in 5 colors: Hazelnut, Sterling, Copper, Calypso, Shiraz. The Cambridge is new and improved!! Weve re-designed the backrest to give it a more supportive design, and re-sized both models to better fit more people. The PR401-SME is the small/medium for people 51 to 56. Deep Seated Comfort with Ultra Soft Back. Easily Raise to a Standing Position. Gently Lower to a Seated Position. SmartTek Inside Patent Pending Diagnostic System. Non-Skid Leg Levelers for Extra Stability and Safety. Easy Access Battery Back-Up System. Floor to Top of Seat : 19. Seat to Top of Back : 27. Seat to Top of Arm : 6.5. Floor to Top of Foot Rest Reclined : 22. Floor to Top of Back Reclined : 33. Foot Rest Angle Closed : 90°. Foot Rest Angle Opened : 175°. Distance Required from Wall Reclined : 18. Extension reclined from Back of Seat to end of Foot Rest : 41.5. Removable Back Option Available : YES. Smart Tek System Standard : YES. Left Hand Control Option Available : YES. Extra Pocket Option Available : YES. Heat & Massage Option Available : YES. Gel Memory Foam Option Available : NO. Power Pillow Option Available : NO. Foot Rest Extension Option Available : YES. Straight Lift Option Available : YES. User Height (suggested) : 51 - 56. The item "Golden Cambridge 3 Position Electric Recliner Power Lift Chair with Chaise S/M" is in sale since Monday, July 17, 2017. This item is in the category "Health & Beauty\Medical & Mobility\Mobility/Walking Equipment\Stairlifts & Elevators".